When I wrote to the people of the Archdiocese on December 8 last year, I said that we’d face a great many legal and financial issues in 2012. Last Sunday, January 29, one of those challenges made Philadelphia Inquirer headlines. A senior member of the archdiocesan staff stole more than $900,000 of our people’s resources before being discovered and fired last summer. Our normal outside auditing firm — independent and nationally respected — had previously found no evidence of criminal activity. The story is not new. In fact, news media first reported this story last July. But neither the Church nor the District Attorney’s office knew the scope of the loss until last fall. We’ve been silent on this matter until now for obvious reasons: to allow law enforcement to do its work. Circumstances have now changed. People are angry about this loss, and they’re right. So am I. There’s no excuse for it. Non-profit organizations – like foundations, Churches, museums and many hospitals – tend to draw mission-driven people as staff. Most of their employees are honest. A few are not. And in a work environment based on shared beliefs and service, a dishonest person can do massive damage. Precisely because religious organizations run on the good will of the people they serve and the dedication of their staffs, they can easily become too trusting in their internal safeguards. But that only makes the need for tight financial controls and accounting procedures more urgent. First, the theft occurred from the general operating funds of the Archdiocese. Monies donated to the Heritage of Faith, Vision of Hope capital campaign and the annual Catholic Charities Appeal were not impacted in any way. The theft also had no effect on the work of the Blue Ribbon Commission or the decision to close or regionalize any school. Second, based on an outside forensic financial review conducted by the firms of ParenteBeard and BallardSpahr, the theft was confined to one senior staffer. No other archdiocesan staff persons were involved. Third, the Archdiocese has worked with the District Attorney’s office throughout this investigation. And we will vigorously pursue restitution from the wrong-doer. Fourth, as bitter as this loss is, insurance will cover much of it. This is little comfort and absolves no one, but as an immediate concern, at least some of the damage will be made whole. Moreover, since Catholic Social Services, Catholic Health Care Services and similar ministries are separate entities from the Archdiocese, they suffered no loss from the theft. Fifth and finally, when I arrived in Philadelphia in September, I began a comprehensive legal and financial review of archdiocesan operations conducted by experienced outside professionals. That independent review is continuing. We’ve begun to apply its recommendations in the way we steward the resources entrusted to the Church by our people. The recruitment of a new chief financial officer is nearing completion. The search for a new archdiocesan controller is also underway. New procedures are in place in the areas where the embezzlement occurred. In the coming year, new and much more rigorous internal controls will take effect, along with tighter budget discipline and a demand for improved skills in everyone tasked with the management of archdiocesan resources. To their credit, Bishop Timothy Senior, our moderator of the curia, and Marc Fisher, the new director of our internal auditing efforts, have been a great help in this difficult process. The task ahead is large. But protections are already in effect to help prevent this kind of damaging criminal activity in the future. Working with our Archdiocesan Priests’ Council, our Archdiocesan Finance Council and the Archdiocesan Pastoral Council now in formation, I do promise that every aspect of our shared life as a Church will be subject in the years ahead to the kind of clarity, greater accountability and careful stewardship our people deserve. Part of putting our house in order should be to call out so called Catholic leaders and hold their feet to the fire. Specifically Rep. Peolsi, I am sick and tired of her saying that she is a good and faithful Catholic! Despite her political actions to the contrary. The following is my understanding of what sins are . . . is this different for political or wealthy people? Enforce the standards and never deviate. 1. Mortal sin is a willful transgression of the divine law by which a person seriously fails in his duties towards God, his neighbor, or himself. It is called mortal because it causes the death of the soul by depriving it of sanctifying grace. 2. Venial sin is a transgression of the divine law by which one fails slightly in his duties towards God, his neighbor, or himself. There are two kinds of venial sin: (a) those that are due to ignorance, frailty, or surprise, and from which even pious persons are not free (Jas. iii. 2) ; (b) those that are due to malice, and which are usually habitual, such as lying, uncharitableness, etc. 3. The effects of mortal sin are: (a) it is an act of disobedience, ingratitude, contempt and rebellion against God; (b) it deprives the sinner of the divine friendship; (c) it incurs the debt of eternal punishment. 4. The effects of deliberate venial sin are: (a) it offends God, and is the greatest evil after mortal sin; (b) it disposes us for mortal sin because it diminishes God’s graces, cools the fervor of charity, and makes one accustomed to sin: “He that contemneth small things shall fall little by little” (Ecclus. xix. i) ; “He that is unjust in that which is little is unjust in that which is greater” (Luke xvi. 10) ; (c) it renders us deserving of great temporal chastisements, both in this world (examples are Lot’s wife, David and Moses), and in the world to come (Apoc. xxi. 27). 5. For a sin to be mortal it is necessary: (a) that the offense be seriously forbidden; (b) that it be committed with full knowledge and consent. If either of these conditions be wanting the sin is only venial. But a venial sin may become mortal: (a) through an erroneous conscience, that is, if the sinner thinks he is committing a mortal sin; (b) if he sins out of contempt for law and authority; (c) if he intends or foresees a grave consequence of his sin, as in the case of scandal. LESSONS, 1. We must not excuse ourselves on the plea that we are weak or have many temptations, because God’s grace, which we can obtain by prayer and the use of the Sacraments, is at all times sufficient for us. Furthermore, if we are weak and easily tempted, we should be careful. If we have weak health we are careful to avoid things injurious to our health. 2. We should guard against venial sins which gradually lead to mortal sins. 3. We should seriously examine our consciences and make ready for a good confession as the necessary means of making straight the paths of our souls. QUESTION: Why does the Archdiocese, in financial crisis, supply free lunches at WIC? Just trying to make sense of a non-profit giving to a government agency? Thank you for your openness and willingness to address the issues. You are in my prayers daily at Mass. May the Lord keep you and strengthen you for the task ahead. Remember that ….”I can do all things through Christ who strengthens me…”. Thank you Archbishop for saying you are angry at a senior member of the archdiocesan trusted staff who steals money from the church. You were right to be angry at her betrayal of trust. I was wondering if she admits stealing, make restitution, confess her sorrow at her betrayal with a firm resolve, if given a change, never to do it again would you trust her and rehire her? That is a difficult question I realize. I am also angry at senior church clergy staff. Like you I want to trust our church senior clergy to always believe and act as Jesus’ direct us “to do to others as we would have others to do us.” With the grave sin of allowing Catholic children to be abused, paying parents for their silence, moving abusing priests into other parishes knowing the history of abusing priests again abusing additional children is beyond my ability to trust senior clergy staff. The senior clergy has yet to admit their involvement, confess their sorrow over failing to obey Jesus’ command to do no harm to children and while knowing Jesus said harming children was punishable by death. Our conscience helps us to know what is right or wrong. Your trusted staff employee knew she was doing wrong. My question is how could so many senior church clergy members not follow their righteous conscience? 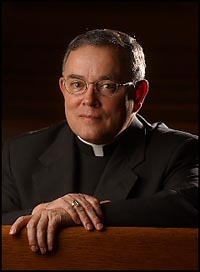 In light of your statement, Cardinal Chaput, regarding the Finance Council of the Archdiocese of Philadelphia, what access, information, input, etc. will be available to individual parishioners concerning the discussions, decisions and reports provided by the Finance Council of which you are the Chairman? This clarity and accountability of which you speak……will the members of your archdiocese be able to participate in these important values with regard to the operation of the Finance Council? When will the Archdiocese of Philadelphia publish a complete, thorough and comprehensive annual financial report that details ALL of the expenses, revenues, assets, liabilities, trusts, real estate holdings, etc? Such a much-needed and long-overdue archdiocesan financial report to the parishioners of the entire archdiocese would do much to accomplish your mission of “clarity” and “accountability”. I am an ardent fan of yours, but I wouldn’t have taken your job for all the tea in the East! I have been in the insurance business for 40 years now and the the most surprising claims have been from employee fidelity loss. The perpetrators were universally trusted and liked, the methodology of the crime astounding and the amounts involved often very significant. In other words, people, particularly larcenous people, are very innovative in their methods of diverting funds, often far ahead of security or or auditors control techniques. Having said that, and with all respect to the good people of Philly, I fear a larger battle looms for leaders of your skill set on the National Arena. It is time to speak out, from the pulpit and forcefully, about the malevolent anti-Catholic administration now dictating our lives. I hope you can work it into your message in a time of trial for your Archdiocese. It is absolutely time to speak out from the pulpit: financial matters, healthcare by big government, illegal immigration! Thank you for your untiring steadfast work for the Gospel. In order to be meritorious Christian stewards we need to be fervent disciples of Our Lord Jesus. It seems that we need to get back to basics. Homilies which challenge the flock to turn away from sin and toward the good without reserve. Obviously many Catholics are not folloiwng Him but believe they are! Almost like having two sides to their being! What is causing this? A lack of conscience? A lack of striving for the good? The Shepherd’s voice needs to be heard clearly by his flock so that they can be led to safety with Lord and away from the death of the enemy! Thank you your Excellency for being unabashed about calling it like it is! For challenging your flock with the Truth! I will pray all involved! Such a sad state of affairs. I appreciate your candor and the way you are taking charge of things. As was said above, it is a pity we can’t focus on the Sacraments and pastoral guidance but, being in the world, we need to be wise in how we manage resources. While it must be hard, know that you are in my prayers and those of so many others. Thank you Archbishop, for your candor and openness on this issue. I am sorry you had to do this, Archbishop. It is too bad your job can’t be just sacraments and pastoral guidance. We all appreciate being told the truth no matter how bitter it is. Next: let’s all fight against the HHS madate to pay for sterilizations, birth control and medicine induced abortions. I want you to know you are in my prayers, and stand your ground!!! This continues to rip away the fabric of the Archdiocese but not my faith! It is clear the past has kicked many cans down the road to your feet and I pray each day for a new beginning and openness. Thank you for your clear explanation, and openness. This is off the subject but are you the George Moore that was once at St,Marks in Bristol Pa.If so i would like to talk to you some time in the furture thank you. before I read the bishop’s statement. Very disconcerted.